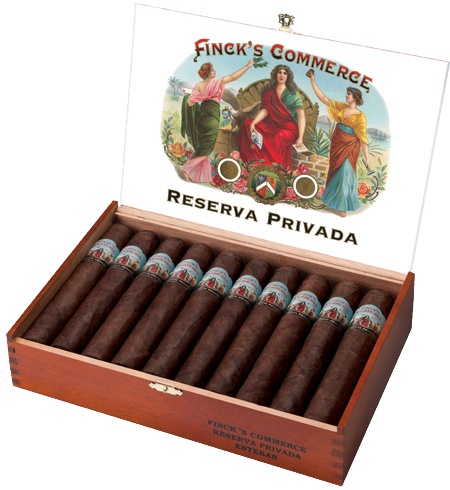 Our newest Dominican cigars, Finck’s Commerce Reserva Privada has caused an unintended commotion at our retail stores! We’ve been working on this new brand for over 18 months and have used some of our regular customers as “tasters” for many different combinations we’ve tried. These guys are so excited about the new cigars they’re driving our employees crazy asking for them! We’re very pleased to announce that Reserva Privada is finally ready, and is a crown jewel in our portfolio! An oily Brazilian Arapiraca maduro wrapper, Dominican Criollo 98 binder and a savory blend of Reserve-Aged Dominican and Nicaraguan Viso, Seco and Ligero long fillers are married in this awesome new brand. The cigars are ultra-smooth and perfectly balanced. They produce volumes of thick, bold smoke with a suggestion of sweetness on the finish. Old-world Cuban-style construction from one of the finest cigar factories in the Dominican guarantees an excellent smoking experience. Even the box artwork is special, taken from our archives it was originally used by our company in the 1920’s. Smoke Finck’s Commerce Reserva Privada and enjoy cigars we’re proud to put our name on!